I'm all about the hand luggage so need a roomy cabin bag. This Ted Baker suitcase is the prettiest thing I've ever seen and it fits perfectly into the overhead containers. I am the worst packer in the world. Every single time, I leave it until the last minute and then panic and throw everything in. This packing checklist from Paperchase is everything that I need! At the moment, I don't have a passport cover which is unlike me- I do love a completely pointless frivolity! This pink passport cover from Aspinal of London is right up my street! Since I tend to take everything on board with me, I'm forever decanting products into smaller bottles so they don't get confiscated at security. Definitely buying this toiletries travel set for future trips. Say what you like, but I love a bumbag. They're just so useful when you're travelling- roomy enough to stash your essentials but still keeping your hands free for all those Instagram photos you're going to have to take. What's not to love? Especially when it's not just a bumbag, but a pink sequin bumbag! Now don't get me wrong, my DSLR is my life. But I find disposable cameras irresistible. It's probably because I relied on them in my teenage gig-going days and now have album upon album of wonderful mid-00s print photos. There's just something so charming about their blurry, overexposed qualities. Needless to say, I am all over this pink disposable camera. Tell me this pastel striped playsuit isn't the cutest thing you've ever seen! My trips are always city breaks and I love how easy this would be to wear while cycling through Amsterdam or skipping through the meadows in Salzburg. It would also be adorable as a cover up on a beach holiday so it's super versatile! When it comes to shoes, I like a big chunky sole. I'll be on my feet most of the day, wandering around museums and exploring the city, so it's essential that my feet are comfy. These metallic Superga trainers are practical as well as gorgeous. Win win! Don't forget the sunglasses! White cat eyes are my jam so I'm all over these Prada sunglasses. 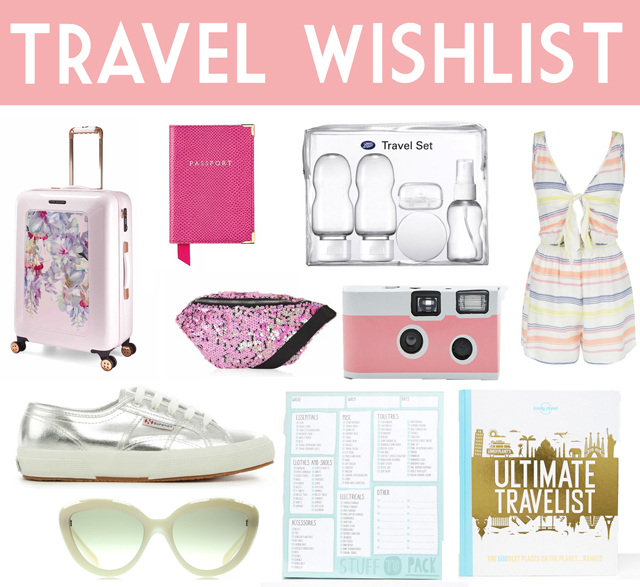 Finally, to inspire my future trips, because I don't have enough places on my list as it is (ha! ), this Lonely Planet Ultimate Travelist book looks amazing! It ranks the top 500 places to visit and apparently includes some lesser-known destinations as well as the more obvious choices. I am so looking forward to the rest of my travels this year. Especially if I manage to pick all these bits up! Post written in collaboration with Daniel Footwear. Affiliate links have been used. I've seen the Ted Baker suitcase before and I absolutely adore it! It is so beautiful!! That playsuit truly is gorgeous, I'm not going away this year but I think I need to get my hands on it anyway! I love the Ted Baker cases and dithered over them and the Lulu Guiness but in the end I could bring myself to spend so much on a suitcase! I love the disposable camera! It's adorable. The Ted Baker suitcases are literally on my luxury list. I've wanted one since I seen inthefrow buy a set!